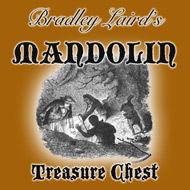 Brad Laird's Free Mandolin Lessons Online! Check out this really cool Mandolin Chord Widget courtesy of Howard Knight. BLUEGRASS JAM TRACKS My favorites for beginners and intermediate players. Grab the free samples and try them out today. FREE BANJO LESSONS Bradley Laird's Free Banjo Lesson site is here! By the way, this is not some Google Ad. This is my own advertisement here. This ad is here to help pay the bills and keep the site up and running. Stroll around the website and you'll find free beginner mandolin lessons, intermediate lessons, mandolin tablature, 23 free video mandolin lessons, 9 free printable mandolin chord charts, and lots of other resources to help you learn to play the mandolin. Use the menu above to scope out the various materials on the site. This series of mandolin lessons is perfect for homeschoolers, self-directed learners, and people without access to a good mandolin teacher. Happy picking! My complete list of video lessons is here. 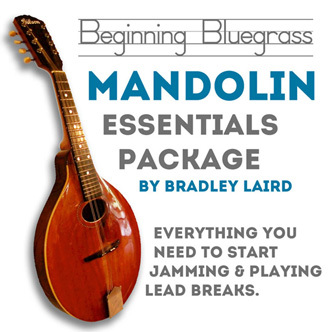 These Beginning Video Lessons have taught 1,000s of people just like you to play mandolin! This is a free video lesson I made a few years back that is perfect for people who are picking up a mandolin for the first time. 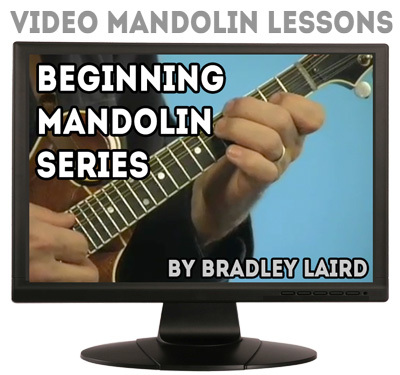 If you like my mandolin lessons check out the complete list of my video lessons here. 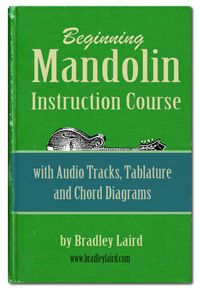 Be sure to check out these Free Mandolin Chord Charts organized by key. For example, if you want to play a song in the Key of G all the chords you will encounter are presented on one page! I have prepared chord chart sheets for all of the 8 most common "bluegrass keys." Those "mega-charts" that list every chord known to man just never made sense to me. I always thought that since chords tend to travel in families (keys) it would make sense to learn them in "sets" which include the chords you are most likely to encounter in those keys. Here's a little sample of my mandolin playing. It's an oldie but goodie called Whiskey Before Breakfast. To get you started you'll even find a beginning version of this tune, all tabbed out for you to practice, right here on my site. Here is my pal Buddy Ashmore and me playing a great old tune called Jerusalem Ridge. You can learn to do this! 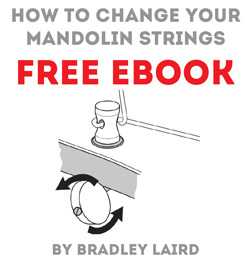 Of course, you should also grab this free eBook which will teach you how to change the strings on your mandolin. Pentatonic scales are the basis for many melodies and very handy when improvising, especially in the bluegrass or rock and blues worlds. If you need help understanding about scales, chords, basic music theory, how to practice effectively, and the always elusive topic of improvising, I suggest you take a look at my book "Mandolin Master Class." Even beginners can get a great head start by studying this book early in the learning process--but it's never too late to get "up to speed", even if you've been pickin' for years! If you like this site I would appreciate it if you would help me spread the word about it. You can "share the site" by using the "SHARE" tool you'll find here and there throughout the site. Also, if you have any comments, suggestions, corrections, etc. that you'd like to pass along to me just send me an email at the "contact me" link below. Thanks a lot and I hope you have as much fun with the mandolin as I have! You have reached the bottom of this page. Be sure you go back to the top and explore each of the menu items. That's where you will find the free chord charts, free lessons, my videos and my mandolin eBooks.